You Are Now in Bangkok. What to do when you get to Bangkok. If you are tired you should go straight to your accommodation. At these bigger airports the taxi services might have a ticket office, you tell the clerk where you wish to go and you buy the ticket to catch the next taxi available. This is good because you do not get ripped off. You might feel like taking your time and catching the train. Stroll around for a while, ride the moving footpaths, have a meal. (in most large Thai food halls the custom is to buy a token card for 100 baht, or so, then select your dish. The cook will register his sale on the card and you present the card on your way out to collect any change). It is fair to say the food in Thailand is safe to eat, Cambodia and Vietnam, not so safe. 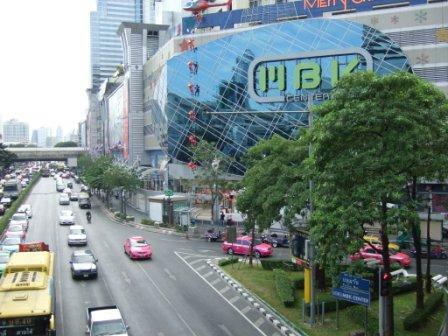 Accommodation in Bangkok If you have not booked a room you should head for MBK, a huge shopping center. There are many guest houses near MBK and a short walk to many attractions, plus it is close to transport. By this time you should have worked out the ATM machine and have some coins in your pocket. Buy a token and catch the train. You are heading for MBK. Once you find MBK then find National Stadium Station. If you walk from MBK towards National Stadium Station you will see a 7/11 store at ground level and almost under National Stadium Station. WHITE LODGE is 100 meters up the lane near the 7/11 store. That is your accommodation. 500 baht a night right in the middle of everything. Tel. 02-216-8867, 02-215-3041 36/8, Soi Kasemsan 1, Rama 1 Rd. (easy to find on the internet). If White Lodge has no vacancies, there are many other guest houses close by. You are now out of Australia and feeling Asia – All is Well. Enjoy the fresh fruit all sliced up and ready to eat – about 40 cents. What next ? Thailand is an amazing place. The people are respectful, happy, clean and mostly Buddhist. There are about 84 million people in Thailand. You will see fine statues of animals in out-of-the-way places, untouched by vandals. You are safe as long as you stay cool;. Don not get drunk, do not argue about prices (barter yes, argue no). In Asia there are prices for rich and poor, a bowl of pork and noodle soup can cost 20Baht in a one shop and 80Baht or more in another. Generally you do not get hustled or ripped-off, but do check your change. What now? Check out some of the biggest shopping centers in the world. Be amazed at the expressways over expressways over expressways. Eat your favorite Thai food for AU$1 or $2,or a 7/11 burger for 26Baht. Catch a local bus around and back to where you started. Buy an overhead rail ticket and ride around all day. Visit the landmarks, gallery and temples Walk endlessly through the lanes and see the lifestyle. Wander through the engineering warehouses. Wander through the endless wholesale markets. Visit the bars in the red light district (not for poorpers). Catch a bus or sleeper train to Chiang Mai and visit me. Where to Sleep If you approach a group of Thias and ask, guesthouse; they will all point in different directions – there is accommodation everywhere. Without luggage to drag around, you can check out as many as you wish. 99% have clean conventional toilets and shower. Price. from 250Baht up usually 500Baht or 1000Baht per room per night. About $8 $15 or $30 (you are lucky to find a 250Baht room in the city and if you did there might be a problem like noise) Most rooms have double or 2 beds. It is your private room and quests are allowed. Security. If you are worried about leaving things in your room then you ask the desk to hold them. In some places lockers can be hired and you supply your own padlock. – $1 or $2 a day. Keep your passport or copy of passport with you. Ask the tuk-tuk driver how-much before getting in. Cabs with a meter are OK, but make shure the meter is on. If you use the taxi or tuk-tuk that is always parked in the same place near your room, that is wise, he will not rip you off and maybe lose his special parking spot. Do not try to change a 1000 Baht note in a soup shop or taxi, 100 Baht notes are most useful or 10 Baht coins. Keep your 1000 Baht notes separate as they look like 100Baht notes same with 500Baht and 50Baht notes.